It's no surprise that climate change will hit some places harder than others. Hot places will get even hotter while parts of the frigid north will become more temperate. For that reason, the overall economic effects of those changes for countries like the US have not always been clear. 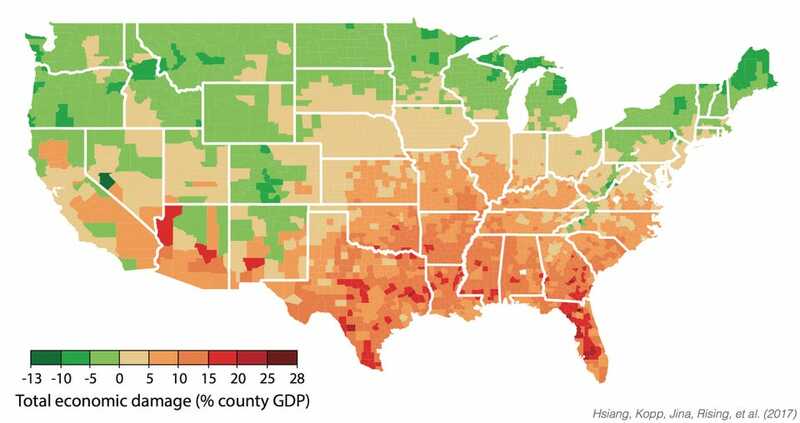 Now, in a study newly published in the journal Science, researchers have calculated economic and other effects of warming for the US down to the county level. And yes — certain regions will benefit. But the overall effect doesn't look good. The researchers predict that the unmitigated warming we can expect to see if global emissions continue as usual will cost the country approximately 0.7% of GDP for each degree Fahrenheit of warming. At present emission rates, researchers think we'll see a global rise in temperatures of 6 to 10 degrees Fahrenheit above 19th century levels by 2080 or so. That 0.7% per degree cost is an overall calculation that takes into account the benefits that northern and western states will see from warmer temperatures and increased agricultural yields. The poorest third of counties will suffer under this scenario, with many seeing losses of up to 20% of GDP. For the study, which was coordinated by the Climate Impact Lab, researchers ran 29,000 simulations, using economic models and research on the crippling effects of high temperatures to calculate county-specific effects. In many of the places that will suffer most, health is expected to worsen as heat and disease claim more lives, agricultural yields will fall, and energy costs will increase. Extreme heat will likely drive up violent crime and slow productivity. Plus, sea level rise and natural disaster risk is expected to increase in much of the Southeast. Factors not included in this model could somewhat change these calculations, outside economists not involved in the study told The New York Times. It's possible that people will leave places like Texas and Arizona and migrate to newly temperate northern states. International refugees or the collapse of ecosystems like coral reefs could worsen effects in some states. Still, the overall conclusion of the study is fairly clear. "Unmitigated climate change will be very expensive for huge regions of the United States," Solomon Hsiang, an associate professor of public policy at the University of California, Berkeley, said in a press release. "If we continue on the current path, our analysis indicates it may result in the largest transfer of wealth from the poor to the rich in the country's history."